Provide comfort for the family of Thomas Shrader with a meaningful gesture of sympathy. Thomas Edward Shrader, 69 years old, peacefully joined his Heavenly Father and first wife, Susan on Sunday, January 13, 2019. Tom was born on November 28, 1949 in Davenport Iowa to James and Irene. In 1975, Tom moved to Phoenix Arizona and began his career in commercial real estate. On March 6, 1980 Tom’s was saved by God’s grace and mercy and began teaching bible studies. In 1991, Tom launched Priority Living of Arizona and began East Valley Bible Church. For over two and half decades, Tom pastored East Valley Bible Church which eventually grew into nine congregations throughout Arizona under the Redemption Church umbrella. Tom will be remembered most for his dynamic teaching ministry and his unparalleled ability to make serious doctrine accessible to ordinary people. He was honest, funny and always able to bring truth into real life. Tom was passionate for Hawkeye football and desired to reflect Jesus’ love and mercy to everyone he met. Tom leaves behind his wife, Sandy; daughters, Sarah and Hayley; son in laws, Tyler and Tim; and grandchildren Braden, Gracie, Yale, Reagan, Brooklyn, Lucy, Harmony and McKinli; as well as countless friends. He will be greatly missed yet we joyfully celebrate his new home with Jesus. Tom’s Celebration of Life will be held on Saturday February 2, 2019 at 10 am at Scottsdale Bible Church, 7601 E Shea Blvd, Scottsdale, AZ 85260 and will be live streamed at scottsdalebible.com/live. In lieu of flowers, please send a memorial donation to Priority Living AZ, PO Box 1116, Mesa, AZ 85211 or Redemption Church, 1820 W Elliot Rd. Gilbert, AZ 85233. To share your Tom Shrader story, go to prioritylivingaz.org. 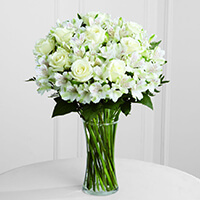 To send flowers in memory of Thomas Edward Shrader, please visit our Heartfelt Sympathies Store. TPNB Bank and Your Baird friends in Davenport an d Cedar Rapids have sent flowers to the family of Thomas Edward Shrader. TPNB Bank purchased the The FTD Cherished Friend Bouquet for the family of Thomas Shrader. Your Baird friends in Davenport an d Cedar Rapids purchased flowers for the family of Thomas Shrader.